SAN FRANCISCO—It’s a common challenge for lawmakers to regulate an emerging business model without stifling it. 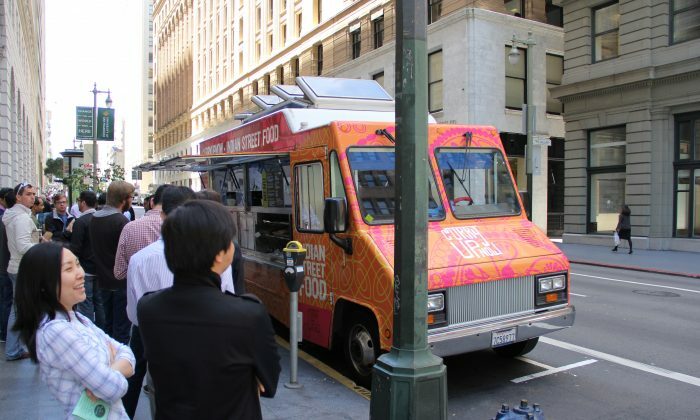 These days, San Francisco supervisors are busy tackling the booming trend of food trucks by creating clearer regulation on permits, locations, and times of operation. Food trucks, or mobile food facilities as officials call them, provide a low entry barrier for entrepreneurs to start a small business, while the availability of more ethnic and creative food has delighted patrons around the city. However, some people have been less than enthusiastic about the food truck boom. Brick-and-mortar restaurant owners complain about unfair competition from businesses that can simply set up shop next door without paying rent. A package of legislation, introduced by Supervisor Scott Wiener, promises to remove the conflict between the two sides. The legislation “will modernize and rationalize how San Francisco regulates the food truck industry, with the goal of encouraging a flourishing food truck scene as well as a flourishing brick-and-mortar restaurant scene,” said Wiener Monday at a Land Use and Economic Development Committee meeting. The most significant changes are that for the first time, food trucks would be banned from operating within 75 feet of the front entrances of restaurants. At the same time, they would be allowed to venture onto hospital and college campuses between 10 a.m. and 7 p.m.
Additionally, a food truck company would only be able to sell food up to three days a week in one location. Since the Department of Public Works, responsible for issuing permits, has struggled to keep up with enforcement, the proposed legislation would enable Municipal Transportation Agency (MTA) officers to write tickets for violators. A major point of contention at Monday’s committee meeting was the buffer zone, currently 1,500 feet around secondary schools in the city, which Wiener called “quite extreme.” The zone is meant to discourage students from leaving campus too easily and abandoning school lunches. While the Youth Commission, an advisory body of young people, wanted the distance at 500 feet, or roughly one block, the Unified School District expressed a need for a distance of at least 1,000 feet for certain high schools. As a compromise, the ordinance will allow issuing permits outside a zone of 500 feet for middle schools and 1,000 feet or 750 feet for high schools, depending whether the schools are embedded in a commercial area. Supervisor Jane Kim expressed concern that large-scale fast food corporations might use the food truck model to expand their business. “The last thing I want to see is Burger King or McDonald’s food trucks all up and down Market Street,” she said. The proposed legislation would apply the “formula retail” ordinance to food trucks, but only in zoning districts, that is, in neighborhoods where brick-and-mortar chain stores are banned. Wiener said he is open to expanding the ban citywide. Rob Black, executive director at Golden Gate Restaurant Association, representing restaurants and food truck businesses in the Bay Area, said the legislation would bring an end to this insecurity, which would help food truck businesses thrive. “We have the most dynamic food scene in the country, and part of that is what happens on the street,” he said. The legislation is scheduled to be voted on at the full Board of Supervisors meeting on June 25.